In truth, the tennis achievement of 2013 had its roots more than six months before, in one of Serena Williams’ favourite cities, Paris. For it was there that she would begin an 18-month run of almost unparalleled and unbroken success—109 wins for just five losses. And, as she prepares for 2014, there is no sign of any diminishment of her powers or her winning ways. Williams had only returned to the tour in the summer of 2011 after a year away with injury and life-threatening illness. She immediately won 23 out of just 26 matches—including two titles and a final finish at the US Open—and hurtled through the first five months of 2012 with titles in Charleston and Madrid and a semi finish in Rome. But if that was not proof enough of the Williams fighting spirit, what followed at the French Open certainly banished any remaining doubts. After an impressive clay swing, she made a shock first-round exit at Roland Garros—the only time in 15 years of Grand Slam competition that she had fallen at the first hurdle—and it hit her hard. In an interview for CNN last week, she talked of the time that followed as ‘dark’, confessing that she did not leave her house for two days. But Williams soon picked herself up, dusted herself off and, yes, pretty much started all over again. Instead of fleeing Paris, she headed to the Patrick Mouratoglou Academy and began hitting. and so began a run to match any on the tour—even the one put together by the returning Rafael Nadal this February. She would lose just one more match in 2012, the quarters in Cincinnati, and end the year with titles at Wimbledon, Stanford, the US Open and the WTA Championships plus, for good measure, Olympic gold. And this year, she carried on where she had left off, opening with the title in Brisbane, the final of Doha, followed by an unbroken run through Miami, Charleston, Madrid, Rome and—the appropriate culmination of her year’s endeavour—the French Open, 11 years after winning her first. Williams’ Wimbledon fourth-round loss brought to an end a lifetime-best 34-match streak, a small price perhaps for the triumph in Paris—not that she was remotely satisfied. Instead, she made a detour to pick up the first International title of her career—on clay, too—in Bastad before making a near clean sweep in the US Open Series, winning Toronto, reaching the final in Cincinnati and then defending her US crown. As she headed towards her 32nd birthday later the same month, her career prize money passed the $50 million mark and she was confirmed as the year-end No1 for the third time—even before she headed to the biggest tournament of the Asian swing, the prestigious Beijing Premier. She won that, too, without dropping a set, and crowned the season by winning a fourth WTA Championships, without losing a match. Quite apart from her storming run from Wimbledon to Istanbul last year, 2013 has proved to be her most successful season, with more titles—11—and more match-wins—78 for just four losses—than ever before. When Williams regained the No1 spot in February, she was the oldest woman to do so in the 40 or so years of the computer rankings. When she won her fifth US Open title in September, she was also the oldest in the Open era to do so—a mere 14 years after winning her first. And she ended the year as the oldest winner of the WTA Championships, too. Only two active players in tennis have matched her 11 titles: Nadal equalled it in 2005 and Roger Federer matched it three times, in 2004, 2005 and—with 12 titles—in 2006. And it is inevitably with Federer that the parallels are the most compelling. Both are 32, both now hold 17 Grand Slam singles titles, and he, too, returned to No1 with a resurgent season last year. 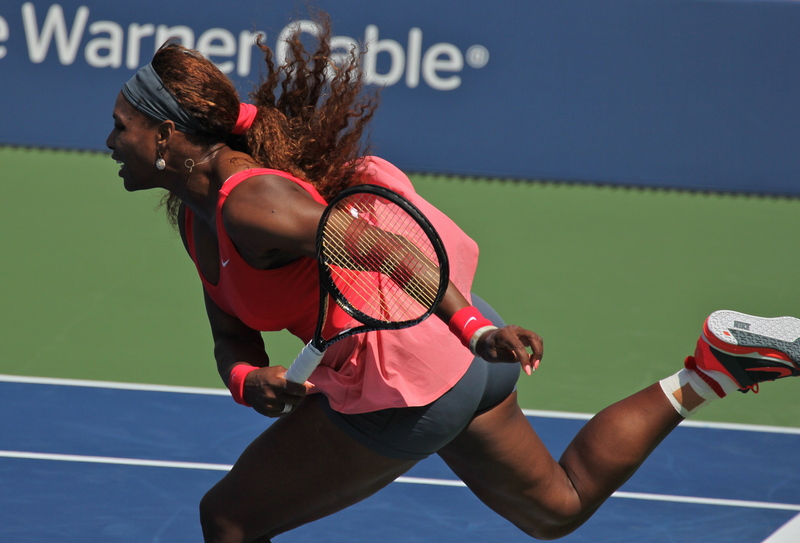 But there is also a significant difference: Williams continues to dominate all her rivals. Indeed the only active woman who has thus far posed a serious challenge is older sister Venus who, until 2009, led Serena 10-9—but she has not won a match since. Federer, though, has accumulated a growing head-to-head deficit against his contemporary Nadal. Against Novak Djokovic, the balance of power has now tipped against Federer, with the Serb winning nine out of 12 matches in the last three seasons. Andy Murray leads their rivalry 11-9, with three wins from their last four matches. And other top-10 players such as Tomas Berdych and Juan Martin del Potro, have also held their own with Federer over the last two years. In short, Federer clearly has an uphill task to add more Majors to his record, while Williams heads to the next in Australia as favourite not just to win in Melbourne but to win more as the year unfolds. She is therefore poised to draw level with the tally of 18 held by Chris Evert and Martina Navratilova—and there are some who can even see her catching the Steffi Graf record of 22. It will, of course, come down to fitness and motivation, though ever since that French Open defeat, she seems to have lacked neither. If anything, what looked like career-ending illness in 2010 has revitalised and reinvigorated her. What surprised me [when she joined the academy] was the motivation she had. She has something really special inside. Overall I’ll remember the wins, but I also want to learn from my mistakes so I don’t repeat them. I have some areas where I can do a lot better for next year and I look forward to it. There’s definitely a lot of things I can add to my game, a multitude of things. When Williams began working with Mouratoglou 18 months ago, she suggested that they keep her trophies in his Academy. They are already up to 16, among them four Grand Slams and two WTA Championships. But don’t be surprised if this outstanding woman adds more very soon—and turns out to be the player of 2014, too.